With the start of spring outfitting just around the corner, we're scurrying to finish up the last of those projects we had on our winter to-do list. Spring is the time when we're getting the Heritage ready for the season ahead. It's also a time of hauling other windjammers on our marine railway so their crews can do work below the waterline. Historically important from the days when schooners moved cargo long-distance, there are just a few of these large marine railways still available to haul the windjammers. Next week the first schooner will motor down from Camden for her scheduled time on the railway. Then every 5-7 days after that for the next two months one schooner will be launched and the next will be hauled, sometimes on the same tide! This is the only trip each season when we plan to sail to the westward. Come welcome summer with us and make some special memories! We see lighthouses and harbors unique to this trip and enjoy some lively sailing. Yes you may see the light as we sail Penobscot Bay but not the full view as seen from this side of the point. It's the only time during the season that we enjoy a traditional "shore dinner". In the age of sail these were held in celebration of the launching of a large vessel. Those invited were often investors and honored guests from far and wide, and they gathered for a few hours of entertainment and delicious food. Tuesday evening we anchor at Cabbage Island in Linekin Bay where the Moore family has been hosting these traditional shore dinners for more than thirty years. Simply reading the menu is a mouth-watering experience. Start with New England style clam chowder followed by a steamed lobster, ear of corn, potato, onion, hard-boiled egg and a handful of steamers, all cooked over a wood fire. If you can find room, for dessert there's delicious blueberry cake with just the right amount of sweetness. You may ask for the recipe but it's a closely held family secret. 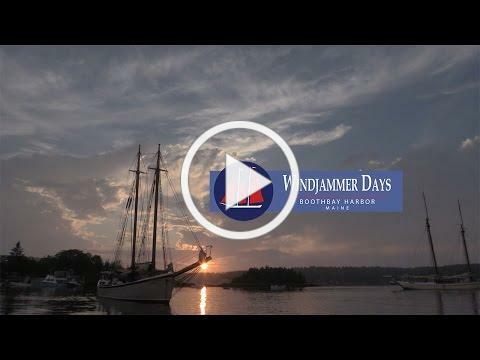 Wednesday we sail among the islands south of Boothbay Harbor and then in the early afternoon lead the parade of sail into the inner harbor. Always a thrill. After we've anchored, there's time to go ashore and explore this lovely small but busy town. You may want to enjoy the street parade downtown before heading back to the schooner for dinner. In the evening, enjoy the fireworks over the harbor. We have a front row seat! Thursday, we set sail and head Down East. We always try to sail close to Eastern Egg Rock in Muscongus Bay where Atlantic Puffins have established their nesting colony. The young families are especially busy with t heir chicks, known as pufflings. Don't you just love it! Friday we sail in Penobscot Bay, enjoying the view of islands, ledges covered with napping seals (although there's always one or two on look-out duty), and of course a few more lighthouses. The sailing during this trip can be exciting. For those of you who enjoy a hands-on vacation, this has your name on it. Here's one lucky Heritage guest, Jack, who has already finished his clam chowder and is getting his shore dinner, complete with lobster and steamers. And unlike our island lobster picnics, there are picnic tables to sit at while you dig in. We hope you'll join us for this special trip.